All you need to do is complete the following sentence to be in for a chance to win a 24 Hour Cream Shadow kit and time with a professional make up artist who can create a customised look from the kit for the lucky winner. NOVALASH CREAM SHADOWS AND _____ ARE EASY TO APPLY AND EASY TO REMOVE. To be in for your chance to win click here. The NovaLash 24 hour eye shadows are a semi-permanent cream formula, designed as “extended wear” cosmetics, to eliminate the need for any retouching throughout the day. The shadows can be worn for an extended period of time without smudging, creasing, fading or wearing off. 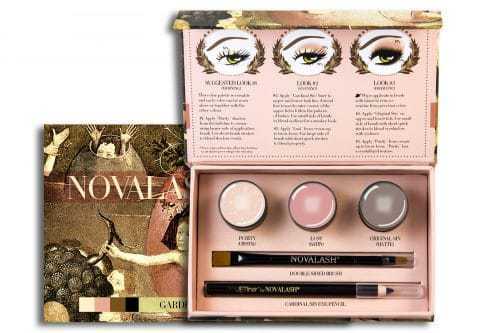 NovaLash Cream Shadows and Liners are easy to apply and easy to remove. Once applied and set, the cream feels dry to the touch but continues to go on moisturising the delicate skin around the eyes. All the shadow colours are based on hues found in artist Hieronymus Bosch’s ‘Garden of Earthly Delights’. The colours range from the smokey shades of the underworld to bright, sunny garden hues, and sweet, heavenly earth tones. This competition will run from 22nd August 2017 to the 17th September 2017. The competition will close at midnight on the 17th September. A winner will be chosen at random from the entries and announced on the 18th September. The winner will be required to attend Olympia Beauty on either 1st October or 2nd October to pick up their prize from the NovaLash stand C10. The professional make up artist look will also be completed on the NovaLash stand and will be arranged in advance with the winner. Answer:Novalash Cream Shadows and Liners are easy to apply and remove.